Happy New Year! We get to kick it off in style with tiaras ablaze - which is the best way to start a new calendar, if you ask me. 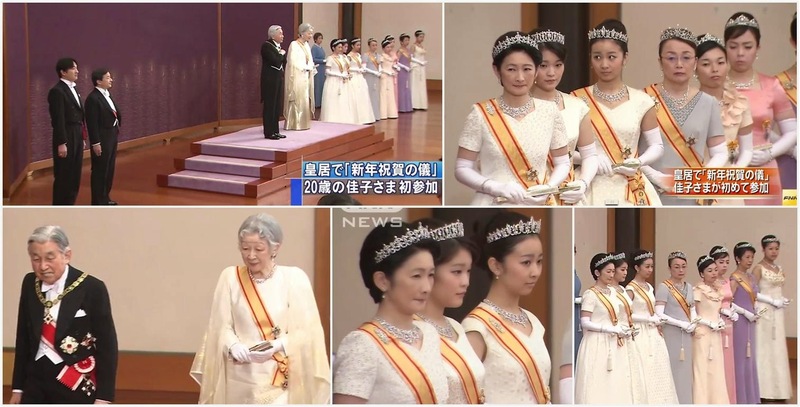 The first day of January brings us sparkling events in Denmark and Japan and plenty of royal fashion awards to go around. We start in Japan, where the Emperor and Empress, accompanied by the imperial family, received New Year's greetings from dignitaries. I always find it a little tricky to comment on the gowns here, since they are all conforming to the strictest protocols and there's not really room for personal expression. But you can't beat them when it comes to sheer numbers of tiaras on display. Each woman of age that is able to attend does, and they all have at least one parure to wear. The Empress has not worn a tiara for a while now, and that continues this year, but the rest are all sparkled up and ready to go. In the mix for the first time this year is Princess Kako, daughter of the Prince and Princess Akishino and granddaughter of the Emperor and Empress. She just turned 20 and got her brand new tiara, and we'll be chatting about that in depth soon. Video, above. For pictures and more video, click here. Next we go to Denmark, where the royal family holds a gala banquet for members of government and other VIPs. It is always one of the most formal events, if not the most formal event, of the year, and aound their shoulders they wear the collar of the Order of the Elephant, Denmark's highest order of chivalry. Click here for a gallery. Margrethe is big on repeating gowns and she usually picks between two tiaras for this event (the Pearl Poire or the emeralds from the crown jewels; one notable exception was the year she wore her brand new tiara). So to see those emeralds and a green lace gown we've seen several times was entirely expected. She's also quite prone to wearing this particular giant fur wrap, so everybody say hello once again to the infamous Yeti Pelt. Princess Marie has had a run of new gowns for this banquet in years past, so I suppose she was due for a repeat. Still, I wouldn't have guessed she'd pick this particular one, worn to Princess Madeleine and Christopher O'Neill's wedding in 2013. I quite liked it as a light choice for a summer wedding, but I'm not sure it can stand up to a heavy gold collar. She wasn't all surprise, though, as she stuck to her standard diamond floral tiara. Flipping things around, Mary - who has worn a repeated gown for the last few years - opted for something new. And I guess my love affair with white will continue strong in 2015, because I can rarely find fault with a simple belted white gown. I love it with her evening cloak, which always makes me want to buy an evening cloak just so I could say evening cloak more often in my daily life, and I love it with the elements of the Danish ruby parure. She always wears the rubies for the New Year's banquet, and this time she's gone for the tiara, the stud earrings with pearl drops, the simplified version of the necklace, the bracelet, and the ring. Lovely, and (no surprise here at all) my favorite for the night. Updated to add: A video of the royal arrivals for you, below, and you can click here for a video on the terribly grand table setting for the banquet. Who was your best dressed from this year's opening round of sparkle? We return to our regularly scheduled programming on Sunday!